I have to own up to something. When the frigid temperatures hit i am a complete wimp. 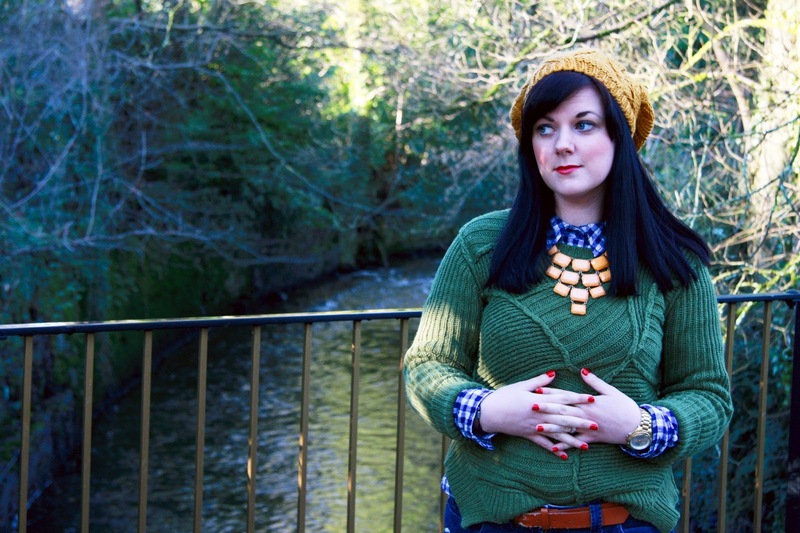 All i can even think of wearing is jeans, layers and chunky knits. When i wake up of a morning and look out the window to see a frost thicker than my mattress covering everything in site, then my mind just automatically picks out jeans, socks (2 pairs), boots, the woolie knits and a big duffel coat. Its been hovering around zero degrees celcius all day today and there is some snow forecast for the weekend! Yay for snow! I’ve bought a sledge in hope that we get enough for us to make the most of the big hills we live on! So after we completed the epic task of defrosting the car (grrr) we went off to the office where i spent the day in a cold tin unit submerged in company accounts…. oh the joys!! I have to say though the layers with my shirt and jumper kept me really warm, of which i was super grateful.. i’m a grumpy cold person! So I don’t know if you’ve noticed, but i’m not one to wear skinny jeans much. This is the only pair i own that i truly love. This pair from Next are stretchy and comfy and have been with me for about 4 years and i love them. However, skinny jeans don’t love me. This may be a contributing factor in to why i am such a dresses girl, but these thighs weren’t really made for skinny jeans. True story, i once got stuck in a pair of skinny jeans in the changing room in New Look. I.was.mortified! I then proceeded to tug and pull till they came off while ripping a rather big hole on one of the belt hoops which i was using as a kind of handle/grip in the whole pulling off process. Moral of the story… Rachel doesn’t do Skinny Jeans……usually. And with that, if you weren’t looking at my thighs before you will be now, hahaha! Anyway enough about my thighs.. how are you? This is my 6 year old coat which i refuse to throw out. Paul bought it for me the first winter we were together as a thank you for all the help with the business. Crazy really, but i can still remember standing in that shop picking out a coat with him like it was yesterday.Oh how time flies! What’s your cold weather go-to? Ps. I have used larger images … what do you think help they eyes or hurt the eyes? You're so pretty! Love the hat. Wish I could pull that off! I'm not usually a skinny jeans gal either and I too have ripped a hole in the side of some trousers when using the belt loops as a tug. I did buy a pair of jeggings last month from sainsburys and they work a dream! I love this look. 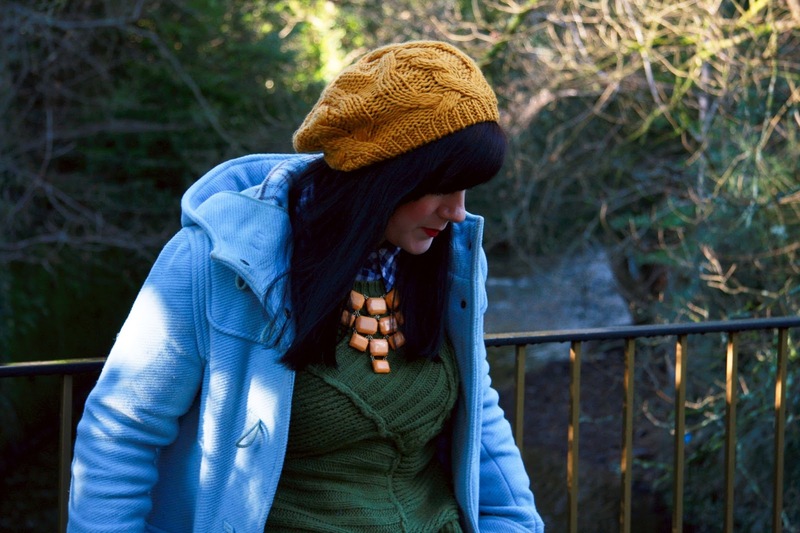 The colors, the layering, the accessories, all of it. So perfect! I always like bigger images – they have more impact. Your a beautiful girl. you have the perfect skin tone for bright colors! i LOVE that hat! its gorgeous! The whole look turned out beautiful. I understand the need to layer up. Layers are the best when it is super cold. I like the blue, green and mustard combo you're wearing here! SO cute! I love this outfit! It has been FAREEEZING here! (0 Fahrenheit and less) it's bundle up or get frost bite.. haha! I love the mixing of colors… & your story about the skinny jeans. I dk how people shove those things on. Some girls wear them soooo tight too. I dk. I'm a dresses girl too! I am not a skinny jeans person either, I wore them for removals day last week and was almost in tears when I came to post the outfit photos. I hate how I look in them SO much as I feel that they just work to highlight my insecurities. 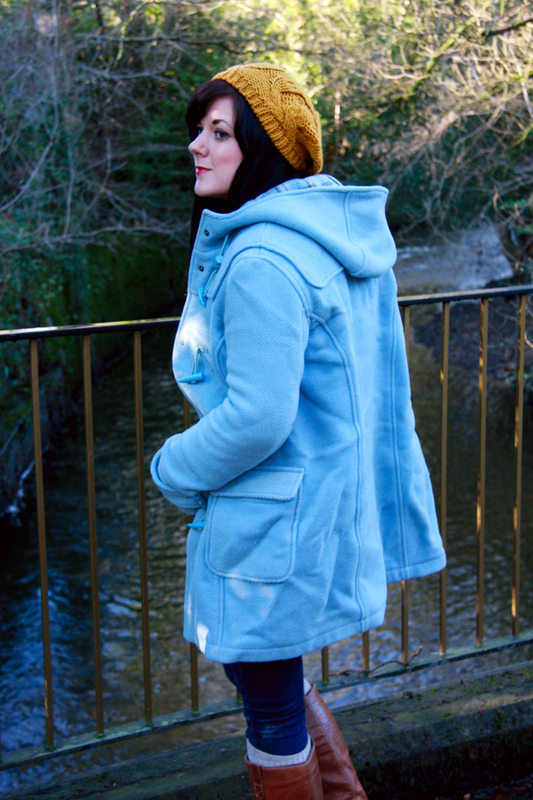 I really love the colour of this coat, so pretty. I have a coat like that, bought by someone as a gift so many years ago and even though it doesn't really fit me anymore, I can't bring myself to get rid of it. 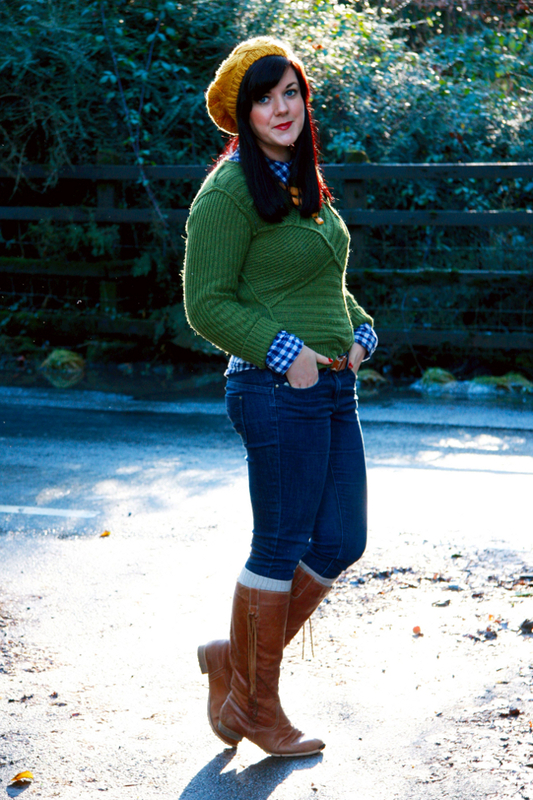 I love this outfit, you make jeans and a jumper look interesting, whereas I just look dull! Love your coat and the hat and necklace together. x p.s. nothing wrong with those thighs that I can see! LOVE the larger images, I can see your pretty face better! I love your shirt- layers are definitely the way to go!! So colourful, as always (that's a good thing) ! Oooh I have so much to say on this post, I will try not to bore you lol. Firstly the larger pictures are great, I love to see the detail closer and clearer I hope you stick with larger images. Secondly, the boots! OMG I love these soooo much. What size shoe are you? Can I buy them from you? Lol only joking I am on a shopping ban at the moment (otherwise that would so not be a joke!) Thirdly I feel you on the whole skinny jeans thing and it is the same reason I gravitate towards dresses. I also got stuck in a pair in Topshop. My problem is my calves, they always fit fine on the waist hips, bum and even thighs but as soon as it comes to my calves… I get really stuck. I am like a pear shape from the knees down lol, very hard to dress for. I tend to stick to short dresses and knee boots, they are the most flattering on my weird body shape I find. Fourthly (yes I will shut up soon I promise lol) your coat!!! I have nearly the exact same one I got from Laura Ashley 6 years ago, mine is a brighter greeny colour but pretty much the same coat! Given that all high street stores tend to buy from a lot of the same suppliers it could actually be the same coat but with different store labels sewn it. It is a lovely coat isn't it? I can't bear to part with mine either. PS I forgot to answer your question (lol) my cold weather go to is fleece lined leggings, knee boots with socks and jumper dresses, pretty much my usual style winterified lol. That coat is so lovely! Love how cozy you look – thanks for the inspiration! You are so stylish, miss! I love that sweater on you. The color is perfect! In love with these bright colors, Rachel! So pretty! 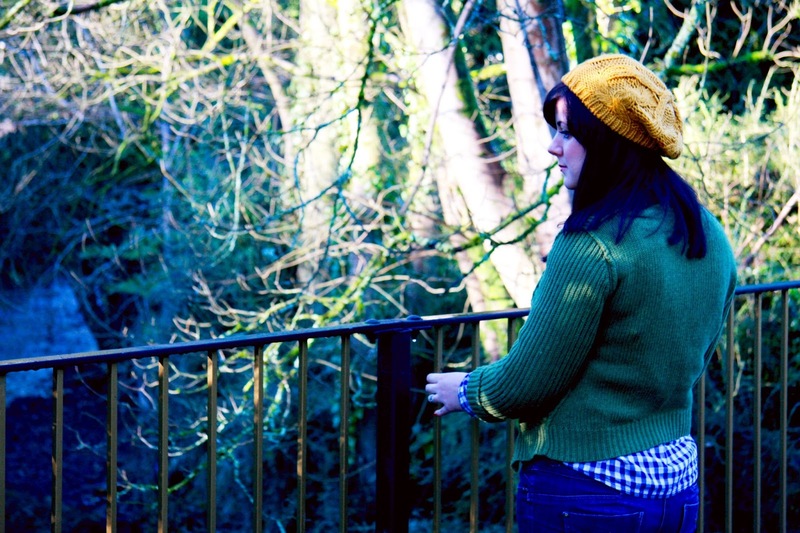 I featured your outfit on my My Style, Your Style post on Sunday, did you see? Feel free to link-up again! Wow! 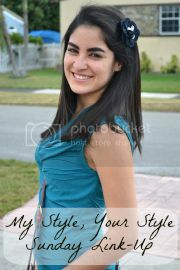 you are beautiful and have great style! love what you put together! thanks for linking up to Ispyrefashion! Ooooh so much to say lovely Rachel!!! 1. I too have neglected you… still checking out your outfits but lacking the time to comment. Naughty Catherine. 2. 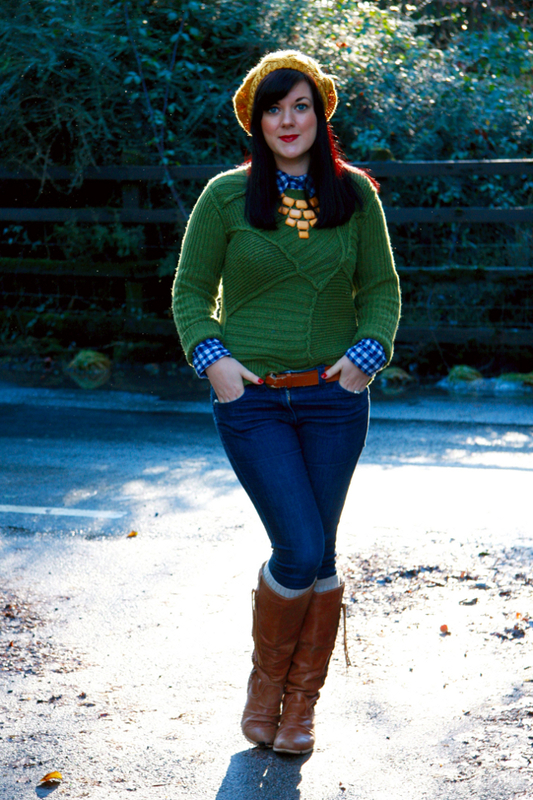 I can't begin to say how much I love everything about this outfit – winter layering perfection! Great accessorising too!! 3. The backlighting from the sun looks gorgeous in the 2nd and last pictures. 4. You look especially radiant in these pics… so, so pretty! 5. Skinny jeans DO look great on you. As long as they're styled right (as you have done), they are super-flattering on most people. Boots always make a big difference. 7. Yes, yes, YES to bigger images! They look amaaaazing! 8. I can beat you in number of socks in the winter… I had four pairs on yesterday. Really! 9. Consider yourself Pinned, young lady. Lots love and stay warm, hun! Aw you look so cozy and cute in your jeans and sweater! And a great hat as usual. Also I really like the bigger pictures. And your thighs are not big at all! I swear some of those jeans in the stores are made for stick people. Like people whose legs are the same width all the way down – which quite frankly creeps me out because I worry about them being able to hold their bodies up. I don't think my legs are big and sometimes I try on skinny jeans and am like, "these are far too skinny for people with any sort of musculature." Anyway. Enough rambling. I think your jeans look fantastic on you! I like to wear jeans lots in the cold weather too, they're so warm and cosy. I run the risk of making them look boring though so have to brighten them up with lots of colours! I love how you have worn them here. what an awesome combination of layers! hahaha frost thicker than your matress- that made me laugh. and Rachel, this has GOT to be my favorite outfit of yours- i love everything about it! the colors, the layers, that pretty statement necklace- i want it all! and i'm the exact same way during winter, just my outfits are way more boring than yours, this is absolutely lovely. I'm so happy that you visited and commented on my blog because it led me to you! This outfit is perfect. The colors, the textures, the accessories. 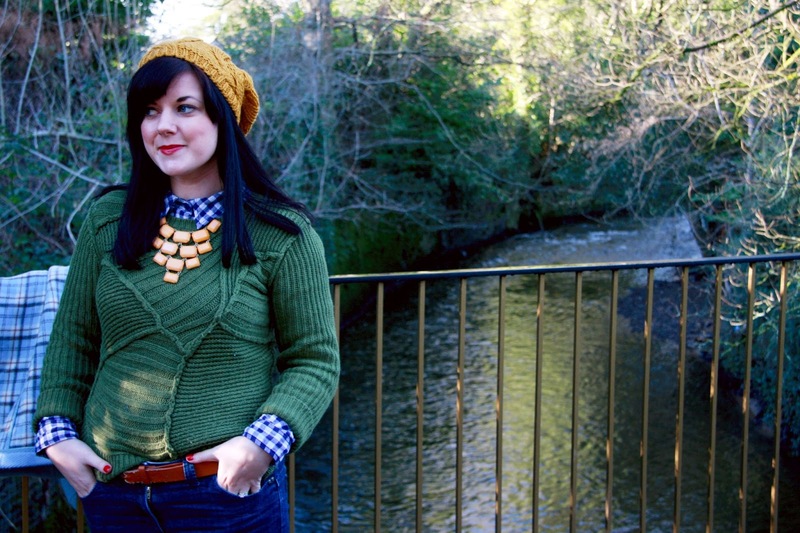 The necklace ties it all in together so beautifully, and don't even get me started on that fabulous green sweater, paired perfectly with that checkered shirt underneath. I love it all!